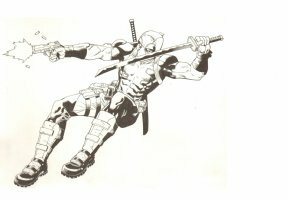 Hello fellow collectors and welcome to Anthony's Comic Book Art! Here you will find one of the largest selections of comic book art on the Web. Just follow the links to your favorite artist or use the search option to search for your favorite hero or character & view what we currently have available. There's something here for everyone so look around & let me know if you have any questions. All art pictured are one of kind originals done for published comics unless otherwise stated. I pride myself on repeat business so be confident that you will be pleased with your purchase and delivery. I have been selling art professionally for over 13 years so buy with confidence.I am always buying and trading so let me know what you have to work with ! I am always BUYING and TRADING ART from all eras, 40's to present. Cant be at the latest convention? Follow along w/ us in the "Show Schedule" Section! "Hi Anthony, The package had arrived with all 3 pieces in great condition. Thank you for going overboard with your friendliness and helpfulness." "Hello, Just a quick mail to let you know that TOD 33 end page arrived safely today. Thanks once more for a smooth transaction, as always impeccable. Look forward to browsing your listing again in the future." "Art arrived today, safe and sound! Thanks a lot for another smooth transaction!" "Hello, Anthony!! Thank you so much for the artwork….it’s even more beautiful in person (especially the fact that it’s signed!! Ultimate bonus, as I hadn’t even realized it was!!) Based on your communication, prices, shipping rates & packaging, I will most sincerely be buying from you again!" "Anthony, Got the page safe and sound yesterday, I really appreciate the $20 customs declaration and marking it as a gift even without asking. You are really in tune with your customers needs and I hope to do more business in the future." 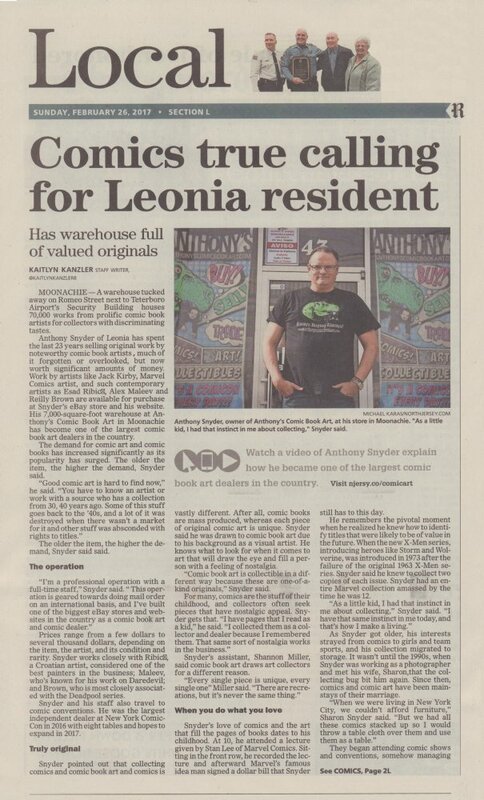 Check out this great interview that our area's newspaper, The Bergen Record, did on me and my business! 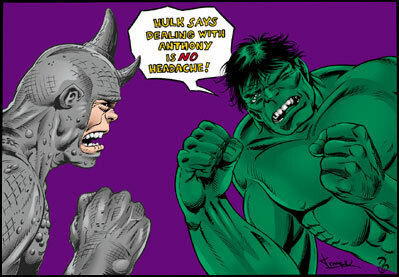 Anthony's Comic Book Art is currently looking to expand its roster of represented comic book artists. 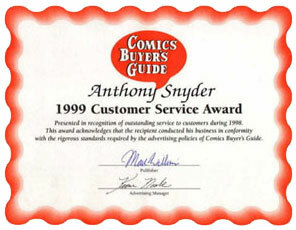 Anthonyscomicbookart.com was one of the first comic book art websites and is now one of THE largest on the web, with a wide variety of hundreds of named artists & thousands of pages. This is possible because of the instant update system, as soon as pages come in the full-time webmaster sees to it that they go up on the website immediately. With the most current site design in the business and a mailing list sent out to thousands of prospective collectors, pages fly out quickly in this very efficient system and ship to all corners of the world. Anthony is the hardest working rep in the business, doing more live shows than any other rep in the country, including a huge presence in San Diego, New York City, Chicago, San Francisco, Philadelphia, Boston and many other cities. With a knowledgeable staff and a portable credit card system, there is nothing standing in the way of doing business worldwide. Being in the business for over twenty years, full-time, and an avid collector himself, Anthony will care for your art like that of his own personal collection. 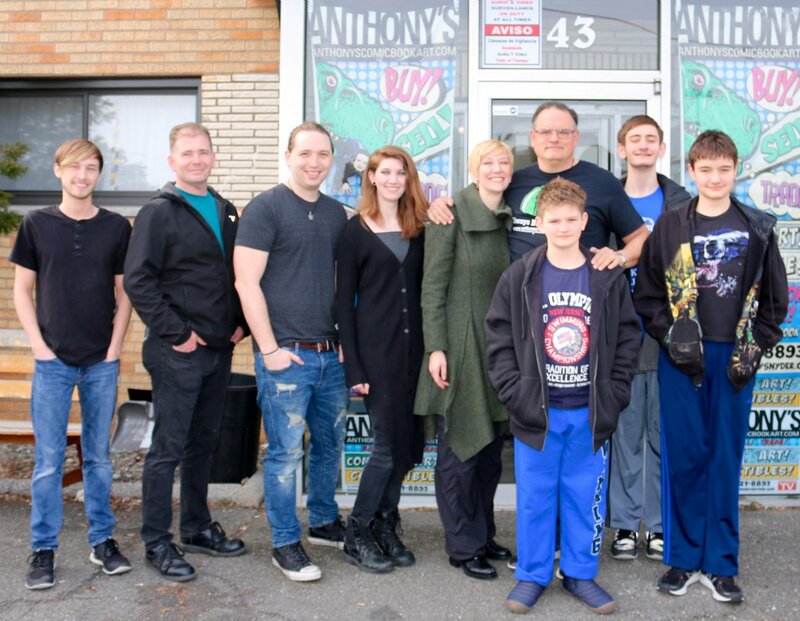 No one treats both his artists and his customers with more respect and professionalism than Anthony and his employees. Recieving this flyer is the most sincere form of flattery because Anthony only wants to work with THE best, that's why we represent some of the industry's biggest superstars including Esad Ribic, Alex Maleev & Reilly Brown. 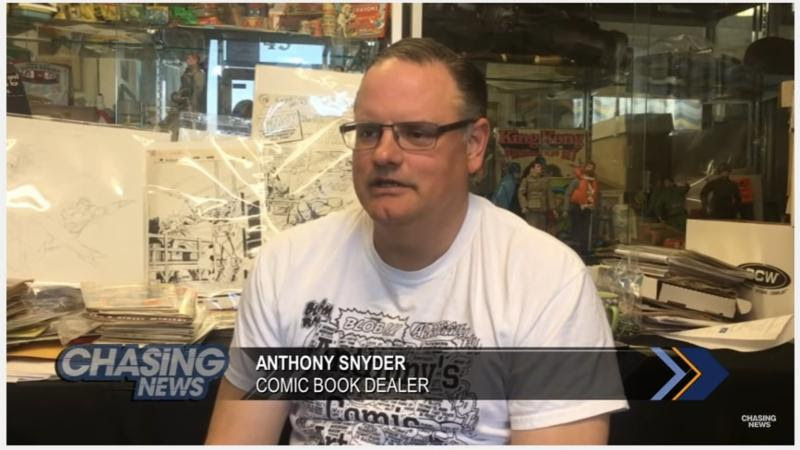 The bottom line is that if you want your work to be seen and purchased by the most collectors possible, there's no better choice than Anthony's Comic Book Art! !! !ALWAYS BUYING BUYING BUYING AND TRADING !!!!! ATTENTION COLLECTORS: CONSIGNMENT SERVICE AVAILABLE IF YOU HAVE ART THAT YOU ARE LOOKING TO SELL LET ME KNOW AND ASK ABOUT MY CONSIGNMENT SERVICES ESPECIALLY IF YOU LIVE IN THE NY NJ CT AREA LET ME KNOW AND WE CAN GET TOGTHER! "Always buying! No collection is too big or too small. Just send me your list of available art and I'll make you a great offer. You can also check my "Want List" to see what is of special interest to me for my personal collection"
Remember to add anthony@anthonysnyder.com to your inbox so our emails don't end up in your spam! Here is a link to my Email address. I hope that you will take the time to send me your wantlist! 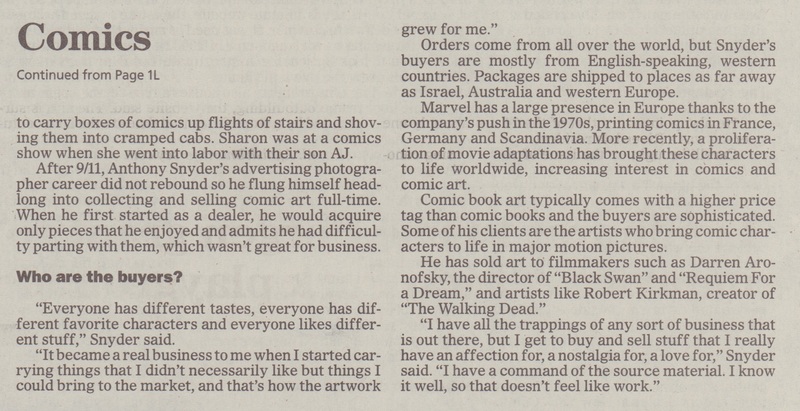 You can also send me any comments that you may have about my site or comic book art in general. I check my Email daily so drop in and give me your feedback! Thanks in advance! !! !Stolen Art!!! The following 2 covers were stolen. Esad Ribic Wolverine #189 Cover "claw coming out of grave" and a Gambit #? Cover by Georges Jeanty!!! Stolen by Richard Cawdell of London England.